Lest you thought we somehow magically gave up eating burgers once we switched to a plant-based diet, here is proof that just the opposite is true. In fact, Blue Moon Vegetarian features two burger recipes, but this one, adapted from the pages of The New Laurel’s Kitchen (Laurel Robertson, Carol Flinders, and Brian Ruppenthal. Berkley: Ten Speed Press, 1986) is my favorite. 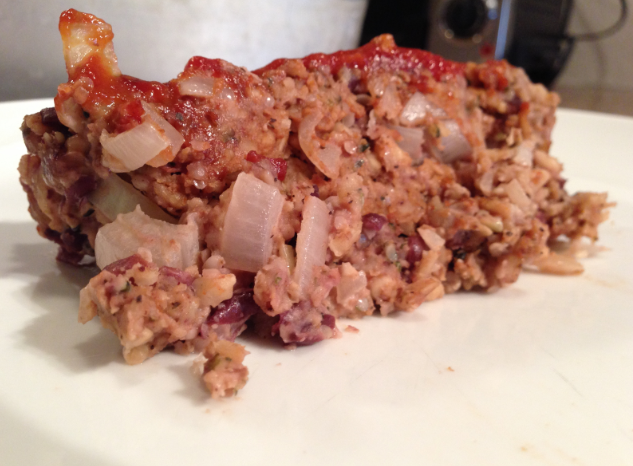 It also makes an excellent meatloaf and “burger” for casseroles and other dishes where ground beef is featured. 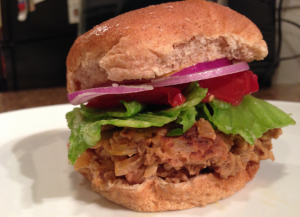 The recipe is heavy on onion, which I like very much, but you can cut back a bit if you prefer. I should also take this moment to plug The New Laurel’s Kitchen, which I discuss quite a bit in my book. If Blue Moon Vegetarian inspires you to start exploring a plant-based diet, The New Laurel’s Kitchen really is a great reference manual to have on hand as you venture further down that road. Not only does it include an astonish array of luscious recipes, but the nutritional discussions and charts and inspiring advice are bountiful and a necessary resource for anyone considering such a change. Combine walnuts, oats, eggs, milk, onion, sage, salt, and pepper. Set half the mixture aside to refrigerated and save for other dishes or make the entire batch into hamburger-sized patties. Brown patties on both sides in a lightly oiled skillet, then pour the stock in around them and bring to a boil. Reduce heat and simmer, covered, for 25 minutes. Serve on buns and dress as you would a beef burger, or crumble and use as you would ground beef in chili, spaghetti, etc. For “meat” loaf, shape into loaf and place in 9 x 6 glass pan. Pour 1 c. vegetable stock around mixture, cover with foil and bake at 350 degrees for 30 minutes. Remove foil and continue baking for an additional 30 minutes.